At thebestof Bolton, we are supporting a fantastic Charity which is headed up by Damian McCoy of Cost and Expense Solutions, a Bolton based company. The work of the charity is to provide wishes and support to children who suffer from terminal illnesses. Some of you in the past have been kind enough to support the charity already. Last year, they hosted the Tear Drop Ball, and after the excellent success of that evening, they're doing it all again this year. 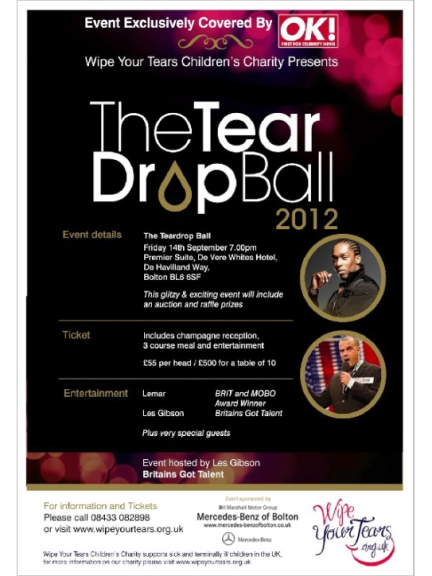 The Tear Drop Ball 2012 will be held in Bolton at the Devere hotel on the 14th September 2011, and will be started by a red carpet champagne reception, followed by a 3 course meal. The evening will be hosted by Les Gibson, Britain’s Got Talent finalist, and Lemar, multi-award winning artist, will be performing. There will also be a raffle and fantastic auction to help raise funds. The night will be attended by a host of local businesses, national companies, local and nation media, celebrity supporters and, most importantly, some of the children we support. It's the perfect event to entertain clients or network with other businesses. We do hope you can show your support to such a fantastic cause. For ticket information please see the flyer attached, or call 08433 082898.